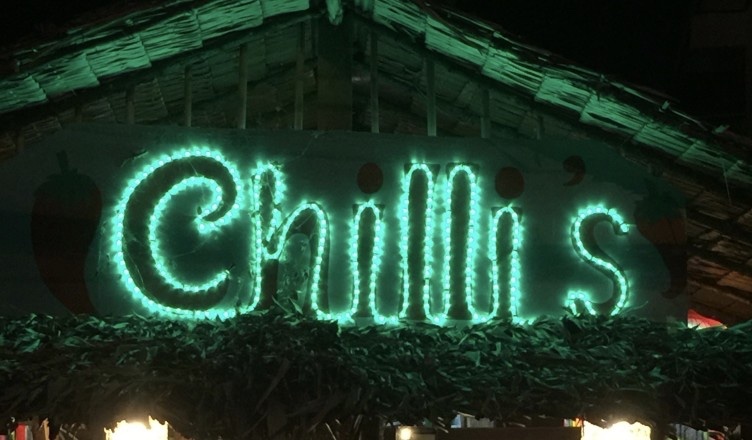 I have no idea why I waited so long to try Chilli’s Restaurant on Koh Lanta, but I finally did a few weeks ago. What a super find! We’ve been back about a handful of times working our way through the menu . Yes, the food is that good! Chilli runs Chilli’s Restaurant. She’s delightful, always full of energy and with a great big smile. Right away this beautiful smile makes you feel comfortable and happy to be there. The menu is big with lots of choices. One side is drinks, the other food. Not like many other restaurants on Koh Lanta that have multi-page menus that include everything and anything. This was my first clue that the food was going to be good. Chilli’s wasn’t trying to do everything, she was focusing on what she does best – Mexican-Style food. 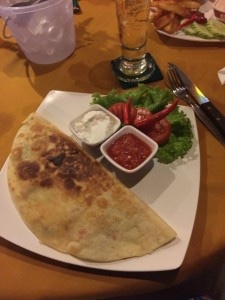 The menu has a few main sections: starters, pizza, quesadillas and hamburgers, with a few salads and pasta dishes. And what a bonus that the print is big, so if you forget your glasses, you’ll be fine. I love quesadillas and was thrilled that they were on the menu. Chilli’s was offering both veggie and chicken fajita quesadillas which put me into a quandary. I wanted both. How was I going to decide between them. I immediately asked my partner if we could come back next week. He’s so used to me and my crazy questions that this didn’t seem strange or out of place, even though we hadn’t yet ordered or eaten. And here I was, wanting to return. That settled it, I would have one type that night, and the other when we returned. He ordered the lasagna and I order the chicken fajita quesadilla. What can I say! The chicken was tender and yummy. The salsa had that right balance between cool and spicy. When Chilli served me my dish, I didn’t dig in right away. Not because I wasn’t hungry, oh no, I’m always hungry. It was because the dish look so good. I wanted to let my eyes savour the colours and shapes. The cutest touch are the 2 chilli peppers on top of the salad garnish. Right on Chilli, you nailed the visual! The lasagna looked just as good as my quesadilla with the mix of fresh colours and of course the ‘signature’ 2 chilli peppers on the salad garnish. And it was a winner so I was told. A perfect mix of meat, sauce, cheese and pasta. The second time we went to Chilli’s Restaurant I really had to control myself to not order the chicken fajita quesadilla. It wasn’t easy but I compromised and ordered the chicken fajita wrap. Close but different! I was not disappointed. It was the same tender tasty chicken as the quesadilla but this time in a wrap with the cool and spicy salsa. Another winner for sure! My partner said ordering was a no-brainer as he was making his way through the menu and was very focused on something different this visit. He opted for the Hawaiian Heart Attack Pizza. He devoured it down only coming up for air when he needed a gulp of beer to wash it down. When Chilli asked him how the pizza was, he asked for a menu. Crazy guy, said he wanted to study it at home and decide what he order next time. Our first clue that the pizza was excellent! Then next time we went to Chilli’s my partner didn’t want to see a menu. 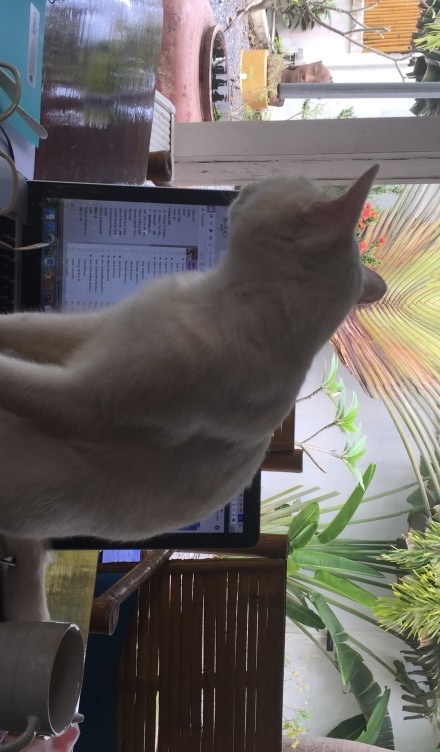 He’d been studying it for a few days at home and knew exactly what he wanted. It was the cheeseburger that was his goal that night. For me, I finally tried the other quesadilla, the veggie one. Both of us were extremely pleased with our orders. There is a very casual hamburger war on the Koh Lanta now, with the locals trying to figure out the best hamburger on the island. It’s a bit crazy and everyone says something different. And everyone seems to change their preference, even when speaking to the same people many time. I figure that the best hamburger is often the last one eaten as people are ‘perfecting’ their order and know better what they are looking for. 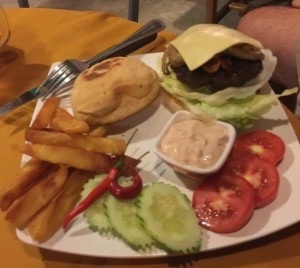 That night my partner said Chilli’s cheeseburger is not only worthy, but that it’s the best on Koh Lanta! I don’t eat meat so I didn’t taste it, but I did steal some fries, and they sure were worthy. Chilli’s Restaurant venue is very comfortable, laid back and relaxing. The place isn’t that big but it can accommodate any number in a group of people with tables for two to a large table that must sit least 10 or more. The restaurant even has a small fish pond with it’s own filter. There are fish of all sizes swimming around in the pond, something entertaining and fun to watch. Actually perfect for someone who is dining alone, or for a conversation topic at any table. And some nights there is this cute tiny dog visiting each table to say good evening to the guests. 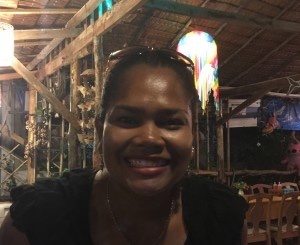 Yes, Chilli’s is a must visit on Koh Lanta for great food, a comfy place and a beautiful smile from Chilli.